I grew up telling stories to myself – to pass the time, to put myself to sleep, and just to exercise my imagination. In the past few years, I have finally begun to write some of these stories and attempt to share them with the world. I find many of my story ideas will traveling, and often entertain my companions by creating scenarios about the people we see on trips. Is that man with a briefcase a jewel thief? What about the couple holding hands at the beach café in Costa Rica? Do you think they are really married? The idea for The Gate House came to me while my husband and I were traveling in England a few years ago. We spent a few nights in a bed and breakfast in Lincolnshire, in the East Midlands. The building had originally been a railroad gate house back in the nineteenth century. My imagination began to work overtime. Could there be a hidden room? What secrets could a building like this hold? We went on the visit the city of Lincoln and its great medieval cathedral, where we were treated to a roof tour, where we were able to walk on catwalks that pass between the high vaulting of the ceiling and the roof itself. Between the cathedral and the gate house bed and breakfast, I had my story. All I had to do was flesh out the characters and write it. I love writing women’s stories, and am fascinated by the relationships women form throughout their lives. 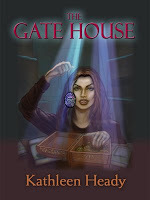 Although my novel, The Gate House, is primarily a mystery, the relationships of Nara, the main character, are also integral parts of the story. Nara is dealing with the apparent betrayal of the man she was to marry, as well as the life-threatening illness of her father. As often happens in real life, while Nara has so much else on her mind, she meets a man who is everything – handsome, intelligent, kind, and available. He pushed the brooch across the table to her. Nara wrapped the brooch back in the tissue paper and put it back in her purse. “Wouldn’t it be more convenient to live in London?” Nara stood at the window looking out. The room behind her was not totally dark, and she thought that anyone who happened to be watching could probably see her. But who would be watching from the river banks at this time of night? She was getting paranoid. “I like it, too.” Nara turned from the window to Alex, who stood close behind her. Impulsively, she took his hand. He drew her into his arms and she felt the electricity of his touch throughout her body. She turned her head upward for his kiss. As the kiss deepened, the thoughts that went through her mind said, “This is right. It’s so right.” Alex’s hands caressed her shoulders and moved down her spine. The touch of his fingertips sent chills from the top of her head back down to her toes. It was more than right. “You look beautiful.” He drew her close again, touching his cheek to hers, before finding her lips again with his. This kiss was even more intense than the first, and Nara found herself giving in to feelings she hadn’t felt with Davis. But, at the same time, she felt as if she were about to head down a slope that she wasn’t quite ready for. She pulled away from Alex’s embrace, ever so gently.